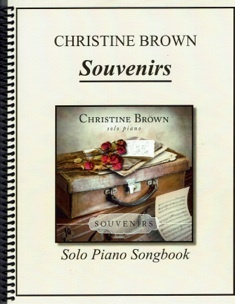 Souvenirs is the companion sheet music book to Christine Brown’s award-winning 2014 album by the same title. 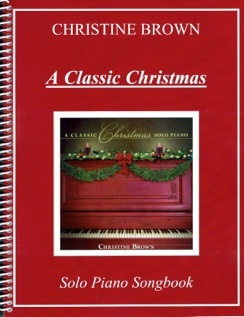 Named “Album of the Year” by Whisperings Solo Piano Radio, all fourteen pieces from the recording are contained in this book, transcribed note-for-note. 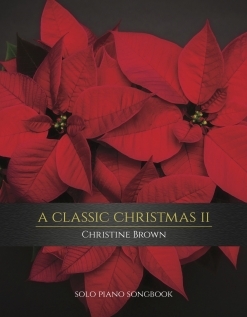 Christine Brown is an accomplished pianist, so this music isn’t what I would call simple, but most pianists at an upper-intermediate to early-advanced playing level should be able to master all of the pieces with some practice. The book is spiral-bound, printed on a bright white medium-weight paper that will stand up well to use, and has full-color covers on the front and back. The notation is clear and roomy and includes pedaling suggestions and metronome settings. I didn’t encounter any reaches of more than an octave and most of the pieces are written in fairly easy keys (listed below); timing is not complicated. A few pieces have notes with more ledger lines than I would prefer, but having a pencil handy to mark in what those notes are (if you can’t remember after a few times through) will take care of that problem. Most of the pieces are composed to be played at a fairly leisurely tempo and there is a nice combination of moods expressed in the music. Pianists of any age will find much to enjoy between the covers of Souvenirs and I highly recommend it. 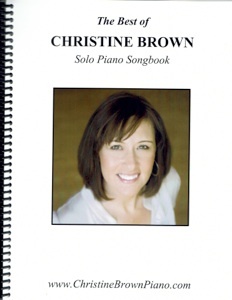 It is currently available from www.christinebrownpiano.com as a physical book, an eBook, and as individual pieces.